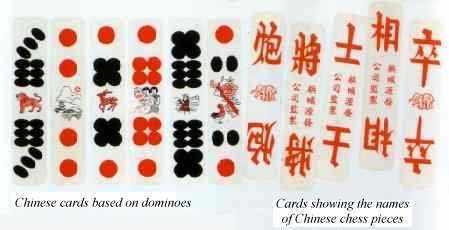 Playing cards are common, everyday objects which we take for granted. Yet they have a history of use in Europe which goes back to the late 1300s; their design is a strange mixture of fundamental changes as well as aspects which haven't changed since medieval times. They are found in almost every corner of the globe. 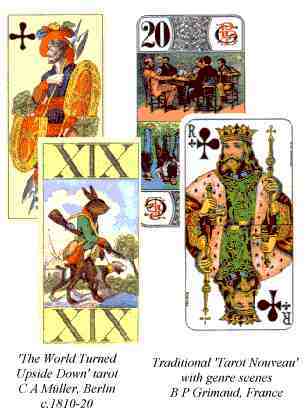 The design of the standard English playing-card is now well known throughout the world because of the spread of card games like bridge and poker. If these are the only sort of playing-cards you have come across you may think that there is only one basic design for the faces of cards, with just the design on the back varying. You would be wrong! The English pattern is not the only design; most countries have their own designs, popular locally, which you may not have seen. These are very often far more colourful than the English one and beautifully printed. 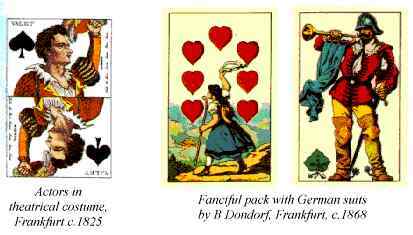 The composition of the pack often changes with the game which is being played; a Swiss players sitting down to play jass expects to find 36 cards in their pack, German skat players use 32 cards, while the dealer of French Tarot has to cope with 78 large cards in their hand. In many parts of the world, different suit systems sre in use, rather than the familiar hearts, clubs, diamonds and spades! And of course, packs are designed and printed especially for children's games-such as Old Maid and Black Peter. 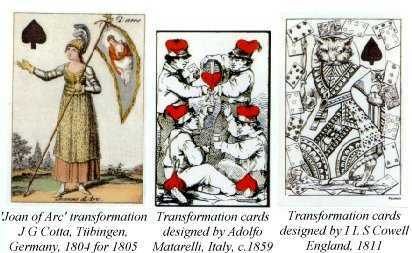 Other Lands - Other Cards - a brief history of playing cards during the past 600 years. Unsolved problems - a collection of unsolved problems in playing-card research. The Guildhall Library accepted on deposit a second important collection of playing-cards, owned by John Waddington PLC. This acquisition complements the previous collection in many instances in a very useful way, and considerably enhances the range of material available for study. Those collections are now housed at the London Metropolitan Archives in Clerkenwell. It is possible to search their catalogue. This page is maintained by Christian de Ryck and John McLeod (webmaster@i-p-c-s.org).